No one knows how to mix classic styling with modern-day engineering like Dodge, and the proof is in the pudding with the 2015 Dodge Charger. If live in Hawaii Kai, Kailua or Kapolei and you're in the market for sophisticated sedan with a touch of muscle, visit Cutter CDJR Honolulu in Honolulu, HI, and check out our huge selection of Dodge Chargers in stock. Our friendly salespeople are ready to take you for a spin in this updated classic this afternoon! You'll think you're in a sports coupe when you're in the cockpit of the 2015 Dodge Challenger sedan, and part of that feeling stems from what's under the hood. Powered by 4 available engines -- a 3.6-liter 24-valve V6, a 5.7L V8 HEMI, a 6.4L V8 HEMI MDS, or the supercharged 6.2L HEMI Hellcat V8 with an unbelievable 707 hp. All models are coupled with an 8-speed automatic transmission with available paddle shifters for a hands-on shifting experience. Two models are available with optional AWD. And just because the 2015 Charger has massive power doesn't mean it lacks in fuel efficiency. The V6 engine gets an estimated 19/31 city/ highway mpg, impressive for a car with a powertrain of this magnitude. The 2015 Dodge Charger is a sedan that's made for all kinds of people. It offers 8 different trims - the SE, SE AWD, SXT, SXT AWD, R/T, R/T Road & Track, SRT 392, and SRT Hellcat. 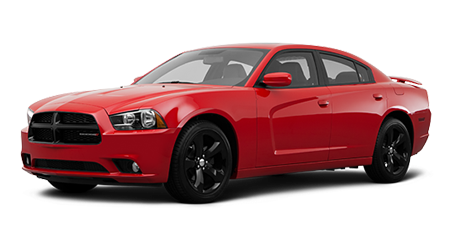 Standard exterior features giving the Charger its signature look on the base SE include 17-inch alloy rims, automatic halogen projector headlamps, a gloss black grille with crosshairs, dual exhausts with bright tips, and body-color lower cladding. Inside the performance-packed cockpit, you'll get a 7-inch digital cluster display and 5-inch Uconnect touch screen with Bluetooth, power driver seat, and 6-speaker audio system with media hub, and upper models add navigation and leather. The SXT and R/T add 18 and 20 inch alloys (SXT and R/T, respectively) heated sport seats, automatic climate control, a power driver's seat, and a 6-speaker audio system with SiriusXM and an 8.4 touch screen display. The R/T Road & Track adds HID projector headlights, power heated mirrors & Dodge Performance pages. Get the next level of power with the SRT and add a 180-MPH speedometer & mesh interior accents, plus a HomeLink Universal Garage door opener. The Hellcat also adds performance-tuned steering. You can stop shopping for a new sports sedan because you've found it in the 2015 Dodge Charger. Get ready to hit the streets of Honolulu, Kailua, Hawaii Kai and Kapolei in a brand new one today. The staff of Cutter CDJR Honolulu are ready to pull one up to the showroom for you to kick the tires and take a test drive. Before you know it, a brand new 2015 Dodge Charger will be parked in your garage!